So you heard they are going to add a new tier of weapons to the SSR Carbuncle raids, and you also heard that these raids are currently the hardest content in the game. You want to farm these weapons, but you can’t stand fighting some WoW-style raids for who knows how many times before you can complete the grind for all the new weapons you want. Well fear not! By becoming a professional ‘Parabot’ you can reduce the difficulty of these raids to Griffin-tier and shorten the time it takes to complete a run by at least two-third. Your friends and the rank 176+ elites will love you and you can almost certain get a place in most pre-made groups. The only downside of being a parabot is, well, you won’t be able to win any MVP race and the only red chests you would ever get are the ones from your own hosts. But hey, we all know that 99% of the time a MVP chest would contain junks anyway so you won’t be missing much by not winning them. It is the flips that matter, right? The SSR Carbuncle raids are notorious for their punishing mechanics and the needs for team coordination. But the health pool of these bosses is only slightly higher than that of the other 6-man HL raids, and some of these bosses like Prometheus and Morrigna have lower base DEF compared to the other HL raids. By having a designated para-man and paraing the boss before the “real fight” begins (usually before the 75% mark), the raid can ignore all those nasty triggers and special attacks. This allow the other 5 players to bring their pure DPS teams and burn the boss down in 2-3 minutes. This greatly reduce the time and stress it takes for the group to farm these contents. Yes, you need a final uncapped and fully leveled Song for this to work. And No, unless you have a group that can dish out 300 million damage in 60 seconds, a 4* Song would not suffice. Her 4th ability is essential in ensuring the boss cannot use any of its skills before the raid turns it into a pile of treasure chests. By landing both her paralysis and the debuff extension, the raid will have a total of 2 and a half minutes (150 seconds) to beat on the boss carefree. As a parabot you have only one job: to make sure your paralysis lands on the boss before the boss hits the 75-85% HP mark. Problem is abilities that can paralysis tend to have low base success rate, and missing the first paralysis might as well mean retreating for the whole raid if the other 5 players enter with their DPS teams. Therefore, the best setup for a parabot would make sure that the debuff success rate of the paralyzing character is boosted as high as possible. Apart from Anubis (who is weak to Song’s element), you would be looking at a base 50% (Promethus, Ca Ong, Gilgamesh) to 70% (Hector) debuff resist rate for most of the SSR Carbuncle bosses. To make it worse, Morrigna seems to have a much higher base resist than her comrades (Possibly higher than that of Hector). To counter this, it is necessary to keep certain debuff resist down debuffs on the boss at all time. A harp-boosted Pilfer (-30%) and the call effect of the premium summon Thor (-20%) are particularly useful here. Together, they reduce the debuff resist of the bosses by 50% which pretty much eliminates the off-element penalty except for Hector and Morrigna. Their debuff resist can be further reduced by stackable debuff resist down debuffs provided by the Zooey and Cerberus in the raid. The para from Song’s CA has a base 55% success rate, and her 5* extension ability has a base 100% success rate. She has a LB/EMP skill that increases her debuff success rate by 10%. She also receives a new passive at 5* which boosts her success rate by a further 10% so long as the number of enemy is one. This means her para in effect has a 75% base success rate (and 120% for her extension skill). 75% is not a really assuring number, considering the fact that the fate of the whole raid depends wholly on you landing your para and your debuff extension skill. The shaky hit rate becomes even more of a problem against Hector and Morrigna who has higher base resist and would reduce that number further. Therefore, you would want as many debuff hit rate boost buffs on Song as possible when she uses her para/extension ability to ensure that the runs go smoothly. A parabot party would usually include a Harp-holding MC, Song and two other characters who can either boost the debuff hit rate of the team or provide a second paralysis in case the first one fails or is not enough. 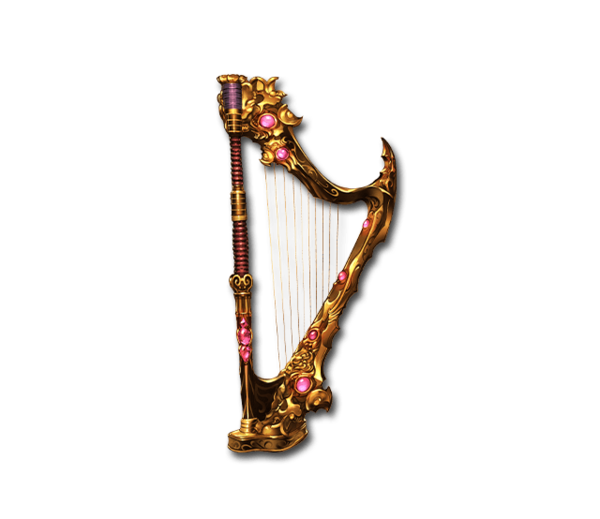 The GW harp (held by either a Superstar or an Elysian) is pretty much your only choice here. Its CA gives a 10% (15% if fully upgraded) boost to Song’s para success rate which is a pretty significant boost. Using Elysian also has the benefit of gaining an extra 10% success rate against Anubis thanks to its on-element bonus passive. If you have Shao and a Cosmo SPE weapon in your grid, you can consider bringing a Kirin Harp and use Shao to para and Song for extension. This setup may be more reliable against Hector as Song is faced with a higher off-element penalty for being the same element as the boss. The debuff resist down debuffs (-5%) from the Harp of the Westerly Winds and Dominion harp do stack with that from Thor’s call effect (unlike most other summon debuffs), but they are generally inferior to GW harp due to how the formula works (making debuff success rate more important in most cases). The Monkey Zodiac, Andira, is single-handedly the best candidate for this job. No one comes close to her ability to boost the team’s debuff hit rate by 30% as early as in turn 3. You should always time your para to make it line up with the strongest interval of her signature monkey buff (which is 2 turns after you used her 3rd ability). If your pings allow, you should also use her 3rd ability again 2 turns before you use Song’s debuff extension to minimize the chance of an accident. If you are not lucky enough to own a Gold monkey, you can still achieve similar results with her free, Silver version (+20% at the strongest interval instead of +30%). However, the longer CD of her SR version makes it very difficult to line her 2nd buff cycle with Song’s extension skill. If you don’t have either of the two monkeys, you can still make do with Korwa’s 1st ability, which provides 5% ~ 25% debuff hit rate boost to the team (depends on how many fils she has when she uses her CA). The problem with Korwa is that you need to keep pushing turns to stock up her fils, which can be a very dangerous things against certain bosses. Raid supports such as Gravity or Fear are needed to allow you to push turns relatively safer. If you do have to use Korwa for this role, try to line the Full Chain within 3 turns of Song’s extension ability coming off its initial cooldown so that the latter is still benefited from the hit rate boost before Korwa’s buff falls off. These three characters have the same passive that gives +5% debuff success rate to the whole party. Their passives don’t stack so there is no need to bring more than one of them. Among these three characters, 5* Altair seems to be the better choice as his 3rd skill (+30% meter to team) allows the team to have its full chain ready earlier. With the July balance patch, Cerberus now applies a -5% stackable debuff resist down debuff on the enemy each time she TAs (up to -30%). This debuff has a very high hit rate and stacks with almost all other forms of debuff resist down debuffs. Her debuff stack does take turns to build up, but with a 50% base TA rate and a further +50% TA rate from her CA she will get there in no time. At six stacks, her debuff is basically a second pilfer which can be quite valuable against bosses with high resist such as Hector and Morrigna (or when the raid needs a 2nd para). If you have both Kirin Harp and a Cosmo SPE weapon, Shao is a viable para-ing character (especially against Hector). The benefit of using him over Song is that you have (arguably) better control of when you want to land your para as his para comes from his ability and not his CA. However, his para is generally less reliable as it has lower success rate than Song’s even with all the boosts from the two weapons. Nio’s 1st passive (+10% hit rate) only affects ability-based debuffs and has no effect on Song’s para (which is generated by her CA). However, this passive can still be useful for boosting the success rate of Song’s debuff extension and Shao’s para (which are both ability-based). For main summon you may choose whatever summon you like. For friend support summon, however, it is almost mandatory to use Thor as his call effect is crucial (together with Pilfer) in neutralizing any base debuff resist the boss would have. If you are the only one bringing pilfer to the raid and you don’t have a matching GW harp for that fight, you should summon Thor before using your pilfer to prevent the latter from missing. Thor can be hard to find in the wild as the general player base often overlooks his usefulness. Until this para strat becomes more prevalent, you will have better chance locating a Thor by joining those pre-made rooms with one. The job of a parabot is simple. You fire your para when the debuff hit rate boost on the your team is at its highest and the debuff resist of the enemy is at its lowest, extend it with Song’s 4th ability and you can post the “Gonna Go” sticker and go afk. In reality, however, unless you have a lower than 80 ms connection to the game server in Japan, you will have to delay your para until Song’s 4th ability is almost ready. This means you have to be prepared to eat 1 or 2 special attacks from the boss unless you can get gravity or fear support from the raid. You should communicate with the rest of the raid beforehand to make sure they don’t go too hard with the dps and push the boss below a certain HP threshold before your para is ready (This is especially true for Gilgamesh and Ca Ong who has the ability to clear all its debuffs with their 75% trigger). You should also have a second hitrate-boosted para ready at around 25% health in case the raid fails to kill it before the extended para falls off. Your second para will likely miss most of the time, but it might save the raid when it does hit. That’s all for this guide. Happy Hunting Skyfarers! You may have forgotten Nio. Nio’s passive only affects the hit rate of “abilities” and thus has no effect on Song’s para (which is generated by her CA). What about Apsaras’ Swan Song? I thought it gives about 50% boost debuff success rate to the whole party. Swan Song only gives +10% debuff success rate which is the same as GW harp, but Ely is generally a better choice as the DATA buff allows the team to have its full chain ready earlier. just wanted to know if chaos ruler’s chaos field increases the chance of landing song’s para and extension? Yes, Chaos field reduces the debuff resist of the boss by 5-15% (Base = 5%, +5% with each minute passed). If your raid has a CR, you should always ask him/her to bring this ability. A few questions for research. Does Andira’s buff stack with Korwa’s? Say if were using Shao, would Nio’s passive stack with Altair’s? Or would you still only bring one? Would previously said passives work from the backrow or do they have to sit in the front? What about Harp of Westerly Winds’ first passive? 1. Yes. Both are special buffs. 2. Yes. They are of different family and thus stackable. 4. That passive only works on wind chars. Are you sure about #4 though? The wiki lists no such restriction and testing it in game, I have the “Boost to allies’ success rate when equipped as main weapon” show up in boosts for Shao. Yes you are correct. I checked again and can confirm it works on all characters. It gives +5% boost Iirc. Thank you for writing this guide. It’s helped me design my support team much more precisely. Song and Anchira are guaranteed lock-ins here. For the last slot, I’m currently using 5* Quatre who is not generally run for pure debuffs due to his random nature. The main strength here is Forfeit, which can guarantee 60% atk/def down with Song + Thor even if there is no Mist in the raid. The debuff I’m unsure about is Corrosion, which decreases debuff resist. However, I’m not sure how strong its effect is. Do you happen to have any information on this? In order to minimize his randomness, I’m also running MLB Qilin + Aphrodite (~5-10% chance of resetting CDs from my limited testing). Between those two summons, his CD reset support skills, and his 4th skill, he’s able to spam his 1st skill at least 6 consecutive times and possibly more. Outside of his debuffs, he enables the use of Grande for the comp, provides the GW Dagger ougi to stack with CoTA, and extends all the stacked buffs to provide fairly reasonable damage for a parabot build. What are your thoughts on the pick? Without more info it’s hard to pinpoint how Corrosion compares a reliable debuff resist down like Cerberus or a reliable debuff success up like Clarisse. Forfeit is great but it’s also random and not technically the goal of a parabot. So does the water yuel 1st skill stack with altair? Update this article please considering Song’s para is on her 3 now not her ougi anymore.